MapleXO Launches The Continuum Collection and a Tattoo Machine Collab! Portland, OR – April 17th, 2015 The skateboard recycling company MapleXO launches a new line of jewelry and accessories, with a jaw dropping collaboration in tow. With 10 new products including a wall-mounting planter, magnetic knife strip, and giant hoops, the collection brings fresh refined edge to their brand as a whole. “We’ve been recycling skateboards now for 9 years. While skateboarding seems to hurt a bit more as the years pass by, I gotta say that it’s rad to see what those years have done to refine our woodworking and design skills for MapleXO,” says Lindsay Holmes, owner of MapleXO. In step with introducing this new collection, MapleXO announces the launch of their tattoo machine collaboration with world-renowned tattoo machine builder Seth Ciferri. Each machine features a custom iron frame, a skateboard wood skin, and a handmade, numbered wooden box. The electromagnetic coil sets that power each machine are constructed with iron cores, handmade skate wood washers, and are hand wrapped with the nostalgic pages of vintage Thrasher Skateboard Magazines to complete the skateboard theme. MapleXO is a recycled skateboard jewelry & accessories company made up of skateboarders out of Portland, OR USA. 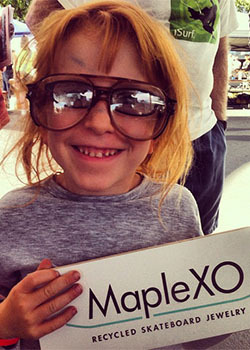 Founded by Lindsay Jo Holmes in 2006, MapleXO is currently sold in over 50 stores worldwide. In 2010, MapleXO began working with PS Stix skateboard manufacture to recycle the industrial waste of skateboard manufacturing in addition to the post consumer waste and is constantly adding to its line of products which now include housewares and furniture. Yet another awesome little write-up featuring MapleXO, along with many other talented and inspiring local businesses, including our friends at OMSI and Next Adventure! The folks at Fathomaway.com have compiled a list of awesome things about Portland, Oregon, and we couldn't be more appreciative to be included as one of those reasons! The good folks over at Save on Energy included us in their green gift guide for the holidays! Highlighting our recycled skateboard bottle opener, they were kind enough to give us some shine in their list, which is chock full of environmentally conscious products. Portland, OR – July 3rd, 2014 Skateboard recycler, MapleXO joins forces with boombox maker, Case-of-Bass to turn skateboards into music and a ramp that is blowing minds. The ramp is a 4-foot tall quarter pipe covered in the colorful maple wood scraps of skateboard manufacturing. To match the loud colors, the entire ramp is a high-tech boombox and was the centerpiece of Portland’s National Go-Skate-Day event, GoSkatePDX. Along with its high quality sound system and beautiful recycled skateboard wood skin, the ramp is built to be skated. In addition to the music bumping quarter pipe, MapleXO + Case-of-Bass are making a personal sized boombox out of the recycled skateboard wood with similar qualities in sound and aesthetic. Three of these boomboxes and the quarter-pipe are being auctioned off along with a gallery full of other skate-themed art pieces at Gallery135 through the month of July. All proceeds from the auction are being donated to help build Portland’s next public skate park. How do YOU go Tandem? To celebrate the launch of our new "Tandem Collection" - a line inspired by togetherness- we're giving away prizes!! We'll pick 5 of our favorite #wegotandem photos to each win a $100 gift certificate to MapleXO.com! Post as many photos as you'd like. Contest starts Monday, Aug 23rd 2013 and ends Monday, Aug 30th at 3pm pst. Winners will be announced the following day! For more information about our Tandem Collection, check out our blog post here! “We go tandem with the people around us. We share an idea, we congratulate, we push each other. We share the stoke of landing our first kickflip with a high-five. We gain courage to climb the cables of half-dome with a held hand. We go tandem with Sheri the barista, Glenn the bartender, Sam the baker next door… In tandem we collaborate our minds and tap into ideas that come from our souls. After many months of sore hands and much anticipation, we're proud to launch our brand new collection for Fall/Winter 2013, Tandem! The line is inspired by the power of togetherness and how people in the MapleXO crew’s daily lives have impacted their designs. “Screw Turners” - A recycled skateboard handled screwdriver set made in collaboration with Portland woodworker Jim Haas. “Machete Necklace” - A recycled skateboard handled mini-machete necklace made from brass or copper in collaboration with Portland artist Anna Evans. All 12 of the new pieces from Tandem are the product of everyday collaborations with our comrades and colleagues. MapleXO is a recycled skateboard jewelry & accessories company made up of skateboarders out of Portland, OR USA. Founded by Lindsay Jo Holmes in 2006, MapleXO is currently sold in over 50 stores worldwide. In 2010, MapleXO began working with PS Stix skateboard manufacturer to recycle the industrial waste of skateboard manufacturing in addition to the post consumer waste and is constantly adding to its line of products that now includes house wares and furniture. The wonderful folks at OMSI (Oregon Museum of Science and Industry) asked us to scribble up a little blurb for their blog as their annual Maker's Faire approaches. It can be viewed HERE. We are very excited to have been invited back for this year's event. Seeing all the excited youngsters is probably as motivating for us as it is for them. They're the future, and we're honored to be given the opportunity to inspire and push them toward a creative path in life. But don't let us forget the "grown ups" who'll be in attendance; they're the ones who were eagerly bouncing from booth to booth as a child at similar festivals ten, twenty, thirty years ago... the ones who helped ensure that these gatherings kept happening, generation after generation. Bottom line: Come out and say hi to us in our booth at the OMSI Maker's Faire this September 14th and 15th!